Christina has a M.Sc. from the German Primate Center, Göttingen, on the reproductive physiology and behaviour of the female lesser mouse lemur and a D.Phil. from Oxford University investigating mammalian sociality and communication in badgers. In the past, Christina has worked on a wide variety of mammals ranging from Australian marsupials to Madagascan prosimians and European carnivores and rodents. Currently, she is particularly interested in investigating the socio-political and biological implications of the involvement of volunteers in ecological monitoring. 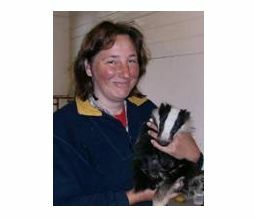 She is a founder and committee member of the UK government’s Tracking Mammals Partnership. Christina has two years of experience teaching general zoology to final year students in Germany and has worked as a Science Officer with Earthwatch Europe. She has been a Principal Investigator with the Earthwatch Institute since 2001 and is also currently the PI running the Mammals of Nova Scotia project, with Dr. Newman.